Regular forces from either side rarely venture in to it and when they do, they go in hard and in strength. More often, the main players exert their influence in the Zone through the local gangs, most of whom hAvg a loose idea of loyalty. 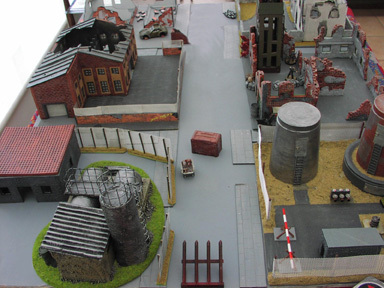 The Zone is bordered by areas equally desolate but more or less under the control of one of the two power blocs. These areas lie outside the borders of either the Western Federation or the Eastern Group but make good bases for the less reputable agencies: private armies, spies, saboteurs and crooks that both sides employ in their constant low-level war with each other. 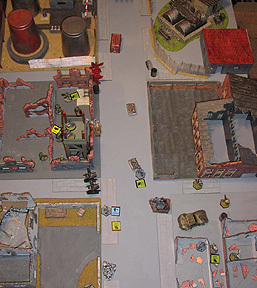 This game centres round a small incident on the western edge of the Combat Zone, in a perimeter area controlled by WF (Western Federation) forces. The area is a fairly typical ruined industrial site. A main road runs through it, ending abruptly in a makeshift road block which marks the beginning of the Combat Zone proper. Overlooking this block on the western side is a police observation tower. This somewhat ramshackle tower indicates the low priority, and thus lack of funding, that the WF government gives this area. This tower is held by a 4 man border police section, based in a fortified police base a couple of kilometers to the west. The duty section is changed every 6 hours, a vehicle bringing out the relief and taking back the off-duty men. Communication is not easy in this area: It's swamped by all sorts of jamming and interference from government and non-government sources Although the powerful equipment in the tower can uaually punch through, the section do not hAvg individual communication with their base. Communication within the section is limited to a telephone link from the base of the tower to the observation platform. 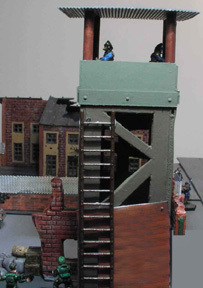 The tower is situated in the corner of a ruined factory and has a sand-bagged emplacement at its base. Normally, there are 2 men in the observation platform and 2 at ground level in the emplacement, although the upper platform can accommodate 3 if necessary. On this day, the section in the observation post consisted of a veteran leader with SMG, an Avgrage sub-leader with SMG and 2 Avgrage cops with auto-shotguns. All had ablative armour jackets. They received a BOLO call about a couple of undercover cops from a different agency: They were on the run from trouble, and were expected to try to escape through the area covered by the OP. Hot pursuit was likely. Sure enough, within a short time, they appeared, scrambling round the road block and sprinting to the haven of the OP. The uniformed cops in the tower looked at each other and grinned wrly. 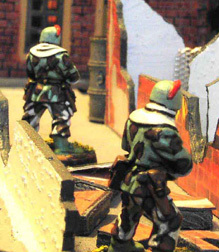 Could it be that these two super-stars had made a slight error by swaggering round the Combat Zone in such sharp suits? When they reported the arrival of the agents the Cops were were told to await a Response Team being sent out to help,. The sergeant in charge told the two agents to take position within the sand-bagged area and to be ready in case if an attack. He doubted they'd be much help, they were armed only with handguns and wore no armour. There wasn’t much love lost between the two groups, but orders were orders. 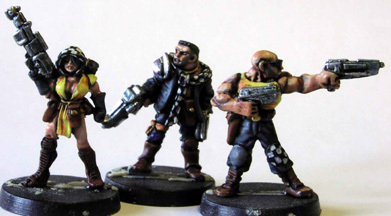 The cops quickly found out that the agents had been rumbled by a group of western rebels they were investigating. A particularly nasty street gang was helping the rebels and these two groups were definitely in hot pursuit. It was also possible that a squad of irregular scouts, nominally attached to a Ministry of Repatriation Infantry platoon, was in the area and likely to assist in the pursuit of the agents.. Within minutes of the agents' arrival, the look-outs on the upper platform of the tower shouted that pursuers were in sight. Three rebels and the scout squad were making their way towards the OP; the rebels flitted through the rubble, obviously intending to outflank the OP from the north while the scouts came straight in. The disadvantage of the cops’ short range weapons in this situation soon became apparent – they caused no casualties as their enemy closed in. 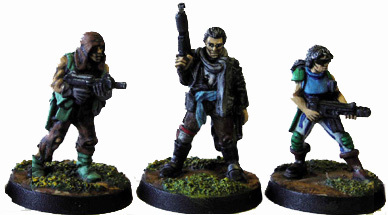 They were soon engaged in close combat with the scouts, soon joined by two of the rebels. The police in the upper tower couldn’t contribute to the melee swirling at the foot of the tower but they were able to shout down to the others that help was on the way; the Response Team were in sight and moving towards the action. Even better, they were accompanied by Captain Standish, a heroic fighter. This was the last good news of the day for them. Even as the Response Team moved up, both cops at the base of the tower and one of the agents, were killed. The remaining agent fled westwards, passing Captain Standish and the Response Team. Standish quickly disposed of a rebel who foolishly attempted to ambush him but the Response Team became engaged in a long range firefight with a section of Ministry Infantry who had unexpectedly arrived from the east. They also found themselves flanked by the gangers who had slipped round to the south. 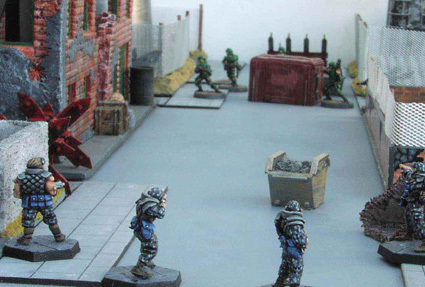 One ganger was swiftly disposed of and the Response Team were heartened by a reinforcement in the shape of a some regular infantry who had been conducting a NBC exercise in the area. They had heard the firefight and, in time-honoured fashion, had “marched to the sound of the guns”. 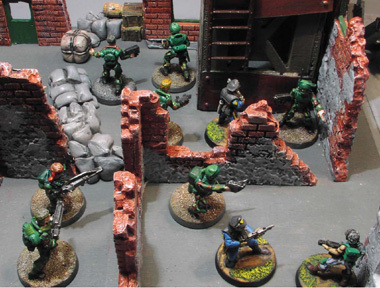 They engaged the gangers but, just as the situation appeared to be turning towards the western forces, one of the gangers spotted the surviving agent fleeing to safety. 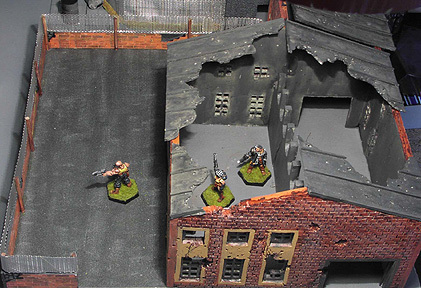 The ganger managed to get off one shot as the agent passed a gap in the wall he had been using for cover. He was hit and killed outright. Both agents were dead, taking valuable information with them. An undoubted defeat for the WF. After this, the rebels and their supporters retreated, leaving 2 cops and 2 agents dead for the loss of 1 rebel, a scout and one ganger. Several combatants on both sides were wounded but managed to survive. I havn’t given details of secondary weapons, armour etc. All figures were assumed to be armed and armoured as seen. Western Forces – exit agents over western baseline in company with Response Team. Western Forces Police section and agents in OP. They may not be on Opportunity Fire. After 5 moves, both sides can dice for reinforcements. 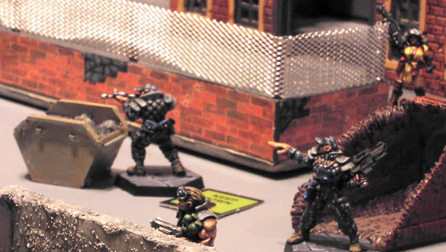 Without going into details, these arrive depending on dice throws and may not arrive at all (they all did). They arrive on their respective baselines. The game went smoothly; all reinforcements arrived and took part. 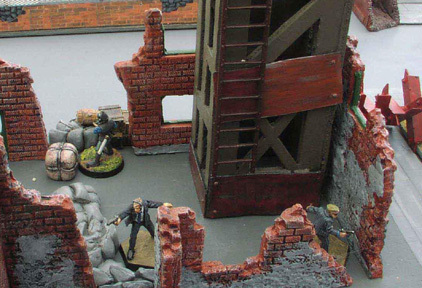 The cops were defeated rather easily (the 2 in the upper tower were not able to take much part in the close range melee at the foot of the tower). After that, it was a question of whether at least one agent could escape. He came close but didn’t quite make it. End of game on move 10. The victory conditions and limited time meant that casualties were quite low. surviving agent fleeing to safety. 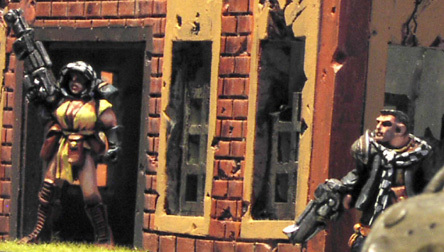 The ganger managed to get off one shot as the agent passed a gap in the wall he had been using for cover. He was hit and killed outright.